It is officially esoteric sticker month here at the archive. 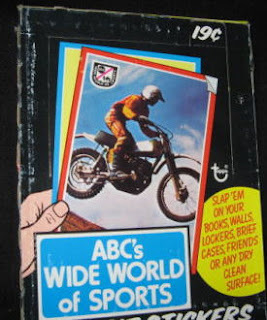 Today we take a look at a relatively unknown large (in dimension) set called ABC Wide World of Sports. 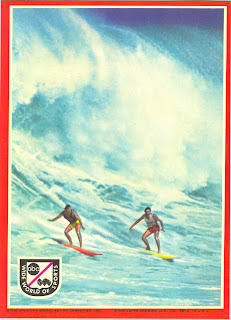 Now, if you are of a certain age you remember this long running sports anthology series that ran on Saturday afternoons and was hosted for what seemed like half a century by Jim McKay. I used to watch it religiously back in the 70's. The cards are untitled, those are my descriptions. 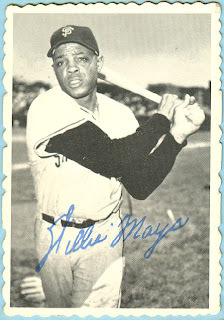 Written ABC and Topps copyrights are in small type at the bottom along with the card number. I don't know why some sports repeat in such a short set. Another Topps mystery I guess! Sometimes a set just falls through the cracks. 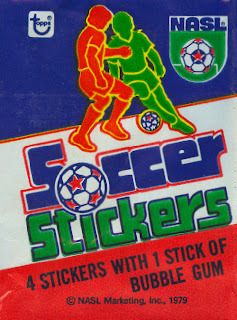 In 1979 Topps issued an obscure set called Soccer Stickers. 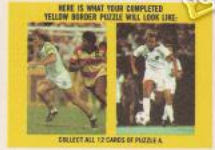 33 in number, the set memorializes the logos and in puzzle form on the backs, three North American Soccer League Players. As far as I can tell this set does not appear in any of the major price guide books. 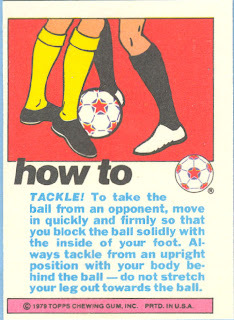 It's not really a non-sports set and it's not really a multi-sport issue and soccer never was considered big enough to appear in the early hybrid (Football, Basketball, Hockey & Boxing) guides. 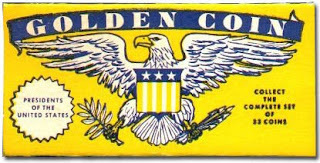 You can buy a full 36 count wax box on Ebay at this very minute for a pittance so there is minimal collector interest. But it's a Topps issue and you would think somewhere a checklist exists but I just can't find one. 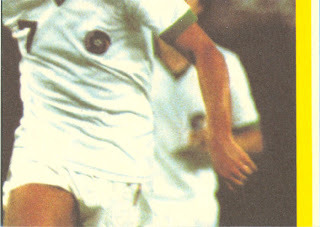 The NASL seemed poised for the big time in 1979 and in addition to a full schedule of outdoor games contested within six divisions, a ten team indoor league was about to be introduced. 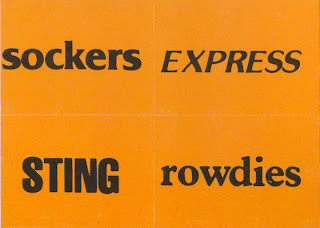 But instead of issuing a traditional set of players, Topps elected to create a sticker set that consisted of team logos and a few 4-in-1 "names" all featured on a hideous mustard colored background. If all 24 logos are in the set, then there would be nine 4-on-1 stickers (36 mini stickers) in all. 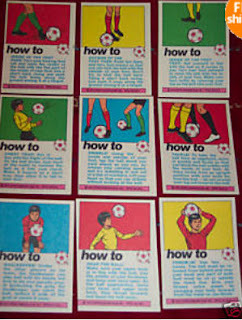 Ernie's store indicates there are nine "How To cards" so there must only be one sticker back showing the yellow bordered poster. I don't know if all stickers were available with all backs or not (possibly not) but a full box would likely yield all the answers. Anyone out there have a few more details? If so, drop me a line. 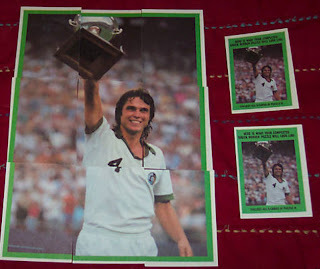 Incidentally, I found a great NASL website here while researching this post. Perhaps the Memorabilia section will get filled in soon. 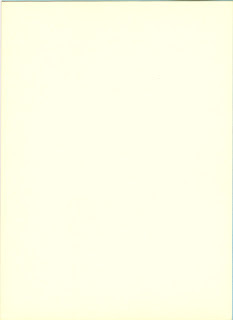 When I posted at the end of May on the 1969 Topps Deckles, I figured it would be a pretty innocuous piece and for the most part I was correct. What I didn't realize at the time though, was that there was a pattern to how the cards were originally ordered, thanks to an e-mail from friend o' the archive Duke, who alerted me to the reasoning behind the two pulled cards and their corresponding replacements. Wilhelm had actually changed teams when the yet-to-play-a-game Royals packed him off to the Angels on December 12, 1968. This left a hole that was made bigger by the the corresponding trade of Rusty Staub from Houston to Montreal early in the New Year as Topps was including players from the two dozen ML teams in '69. 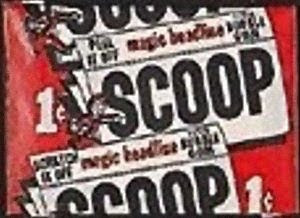 I'll be more alert when discerning the patterns within patterns Topps was creating in my future endeavors. 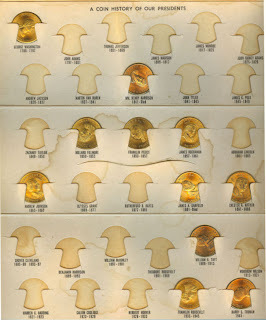 It's a little pixellated but clearly shows the repeating design that was a hallmark of Topps penny packs. I was going to do some super-snazzy stuff to celebrate my 100th post but it seemed trite after some contemplation and besides, it's way too hot today to do anything constructive. 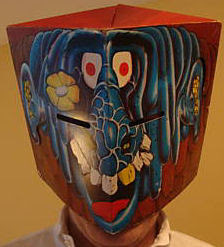 So I figured I would feature an obscure set of Hallowe'en masks produced by Topps in 1967 called Blockheads. Being lazy and unfortunate (I don't own any examples) clearly gives me the massive justification I need to completely use scans and photos from other sources for this post. If you are a fan of the old EC comics, you will note the hand of Basil Wolverton. The whole set is really designed by Wolverton and Wally Wood and was primarily drawn and painted by Topps mainstay, the ridiculously talented Norm Saunders. 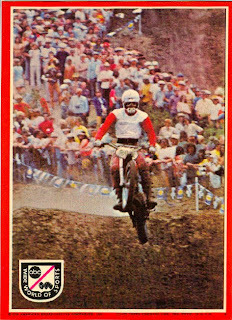 Chris Benjamin's Sport Americana Price Guide to the Non Sport Cards No. 4, an indispensable tome, lists the size of these as 7 1/4" x 8 5/8" but that is too small by half and must have been the folded size. 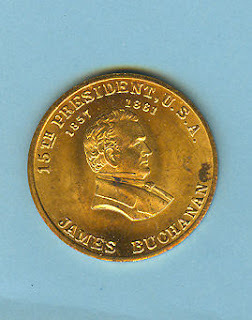 Measurements from the Ebay auction indicate a width of about 14 1/2". 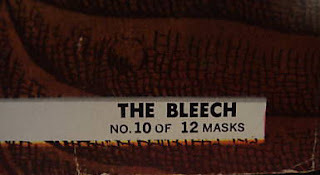 There is a nice Flickr page with more details here including a picture of the box and it links to the Saunders site which tells the story of how these morphed from monster masks to posters (the masks were considered too dangerous by Topps to fully release). These are rare and beautiful. That is really something else! 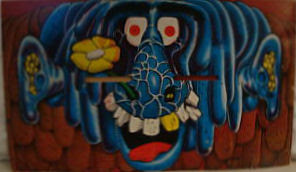 The masks originally sold for fifteen cents. It would cost at least 1000 times that to get one now. 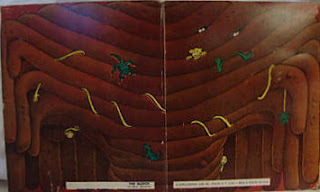 The Saunders site indicates these were recast as 3D Monster Posters but I can't find any information on that set at the moment, or maybe it was retitled and I'm just not picking up on it. The posters would be really tough as well. 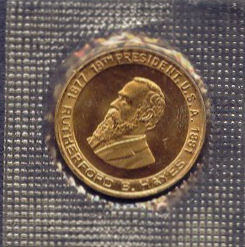 Within you would find one from a set of presidential coins, 32 in number and made of metal. 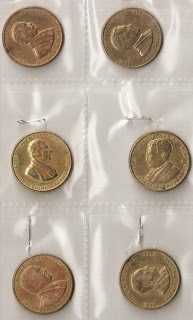 Now presidential math is always a little tricky but with the Grover Cleveland kangaroo jump 33 presidents yielded 32 slots in the album if you're scoring at home and I'd wager when Ike was added the slots were upped by one to 33, even though he was president number 34. Keep this in mind as we look for clues below. 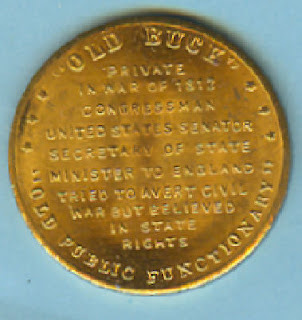 Bear in mind though that there was also a coin minted of the U.S. Capitol, although there is no spot in the album for it. Sorry for the b&w scan there kids! 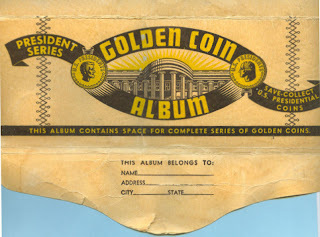 I don't think an album was issued for the OPC set in '56, by the way since there is no mail in offer on the folder. Here is where the mystery lies though. 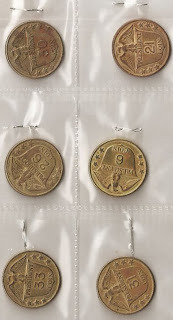 There is supposedly no US counterpart to the '56 coins but what then, do we make of these? 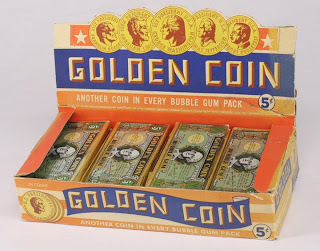 I still find it hard to believe no US version exists, perhaps it was abandoned and rejiggered for the Canadian market but what of the above coins then? 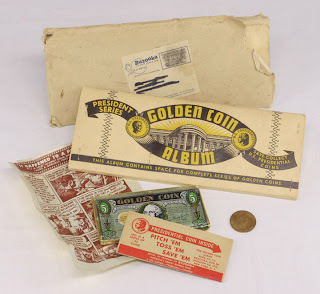 There is some evidence too the Golden Coins were also issued as gas station premiums in the 50's and early 60's so Topps may have just licensed from another source the coins originally and there is more to this set than can be discerned here. The Net54 link above has some scans from Jeff Shepherd you can look at, including a trade ad for the 1949 edition. Well, the set that will not go away returns! 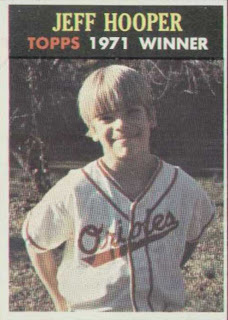 Yes, every time I scan my respective in-boxes, new details emerge on the 1971 Topps Winners. There is a twist this time though-another collector (let's call him Bill Mullins) did some ace detective work and found a newspaper article about Master Lazzari. This is from the Valley Advertiser of May 3, 1972 which served Monessen, Pennsylvania at the time. Monessen is a Pittsburgh suburb so we are zeroing in on one pocket of sweepstakes distribution. 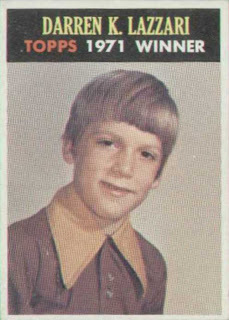 As the article states Darren was "happily passing the cards out to his school chums" and "packages with his picture will be appearing in stores throughout the country" it would appear that while the Winners were from 1971 they were distributed within 1972 Topps baseball packs. It also seems possible they had national distribution but I have to wonder if that was limited to the two or three areas the contest seems to have been held. Other nuggets in the article indicate Darren received 1000 copies of his card and a carton of bubble gum containing packs of 10 regular issue baseball cards plus one of his. This ties in with the recollections of the Bole girls in my earlier posts. 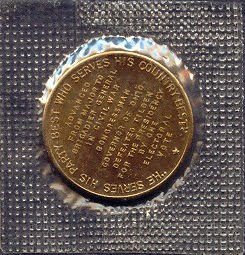 The fact that these were inserts in baseball card packs makes them a bit of a different beast than just a contest card. "I believe the rim colors were based on the division alignments of the NL and AL. Blue rims for the NL and AL East Divisions, Copper for the NL West and Gold for the AL West. That may explain the Sizemore exception. 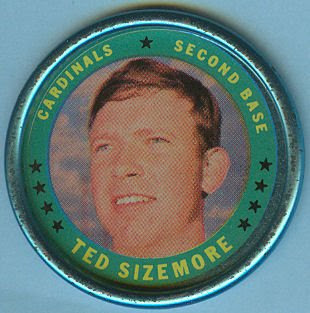 He was traded from the Dodgers (green circles with copper rims) to the Cardinals (blue circles with blue rims). They probably were only able to change his rim from copper to blue, but kept his circle green." Well, the rim/circle theory checks out but my semiotic abilites maxed out last time! He should have had a copper rim as a Dodger (NL West) but his trade to St. Loo (NL East at the time) on October 5, 1970 changed things. His interior color ring of green would not have changed due to happenstance (NL East rings are not blue) but Topps corrected his rim color to that used for the NL East teams. The pattern in 4 pocket rows is disrupted but the overall color scheme remained intact. Wow!